According to the UN, we have 12 years to limit the impact of climate change before irreparable damage is done. This would mean greater flood disasters, droughts, extreme heat and millions more living in poverty. Luckily, we have the opportunity to do something — commit to the principles of UN Global Compact. Growing up in Jæren on the southwest coast of Norway, I have always been fascinated—and a little intimidated—by the ocean. As an oceanographer and Research Director at StormGeo, I study the sea to understand it; and the more I understand, the more respect I gain for it. Because of this, it was a proud moment when it was announced that StormGeo had been selected as a participant in the UN Global Compact Action Platform for Sustainable Ocean Business. Launched at the UN headquarters in New York on World Ocean Day, 8 June 2018, the three-year Action Platform aims to advance the ocean’s economy and sustainability. The ocean is a massive contributor to all of life's well-being—as it contains 97% of all water, produces 50% of all oxygen and has absorbed 50% of all CO2 created by humans over the last 200 years. The ocean also provides millions of jobs, serves as a route for 90% of all global trade, and houses 2.2 million species of wildlife. All of this will be catastrophically affected if we fail to make changes now. As an oceanographer, I’m delighted that StormGeo has recently become a participant with the United Nations Global Compact Action Platform for Sustainable Ocean Business. As a company focused on decision support for weather sensitive operations, we have decades of knowledge, experience and data to contribute to efforts in ocean sustainability. StormGeo is out on the water every day—making real-time observations, reporting and gathering information. For example, our Metocean experts and Meteorologists survey currents, waves, temperature, salinity, turbidity, solar intensity and chlorophyll, as these parameters can greatly affect the operations of our clients in shipping, oil and gas and offshore wind. As a result, we possess a large amount of data on the oceans. One example of this data is the reporting done on the vessels we route every day. The conditions they face provide a mine of information that forms an important foundation for scientific marine analysis. This data could be extremely helpful as a basis during discussions with the UN and other participants in the Global Compact. Using our observations, our clients are able to make informed decisions that impact safety, fuel usage and the environment. In 2018, StormGeo routed 64,000 voyages. With an average fuel savings of 3% from weather routing, we enabled a savings of close to 1,000,000 tonnes of fuel, which reduced emissions by 3,000,000 metric tons of carbon and saved our clients $400-500 million. Our data also helps our clients become more aware of how their business impacts the environment, along with what they can do to lessen that impact. This will be a key role for us in the UN Platform—potentially even contributing to changing regulations by educating clients and stakeholders on how to make operations more sustainable. It is vital that our clients have a good understanding of the environment they operate in, particularly in harsh Arctic climates, where observation networks have historically been lacking due to limited access. One of our responsibilities is to ensure they are aware of the importance of investing in good observation networks, which will help to build a database on these environments. With greater awareness around the impacts of climate change, StormGeo has shifted from a company driven primarily by present, short-term insights to a future-focused organization. Our clients help us drive this mandate further by exploring their future expectations, including long-term operations, and emphasizing their own sustainability goals. To bolster our ability to contribute to ocean sustainability initiatives, we have recently appointed top researcher Erlend Moster Knudsen, who holds a PhD in climate dynamics, as Senior Data Scientist at StormGeo. He has been hired specifically to work with the UN Platform, bringing his expertise in data science and advanced analytics to the table, along with his involvement in public awareness campaigns on climate topics. Part of Knudsen’s role will be to communicate new research projects and topics to clients. I’m very excited to work with him on building up internal sustainability initiatives here at StormGeo, as well as for our clients. 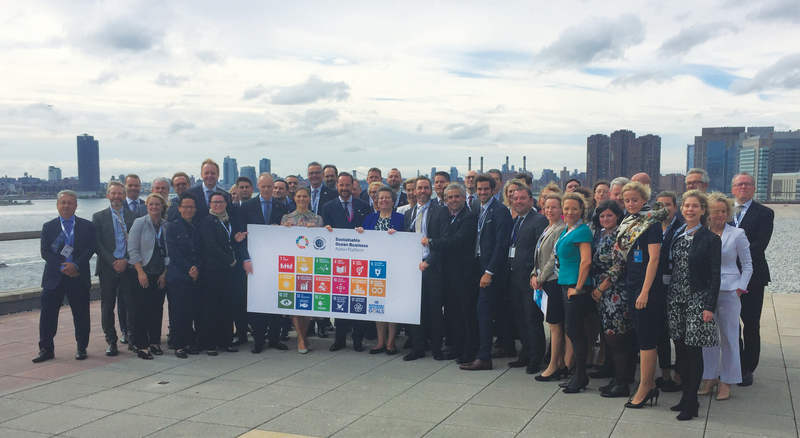 StormGeo CEO, Per-Olof Schroeder, at the Sustainable Ocean Business Action Platform CEO Summit in September at the UN Global Headquarters in New York. We are a private company, and an extremely commercial one at that, so the balance between research and building products is not an easy one. One of my concerns in leading the research team here is ensuring that while we consider the needs of our clients and build our own competence, we simultaneously take into consideration and respect the environment. Some draw inspiration from the ocean through surfing, swimming or scuba diving. For me, it’s the ocean’s complexity that fascinates me, as well as learning how to protect it. As part of our role in the UN Global Compact, we must pass on the respect, care and understanding of our greatest life-source so that it may continue to sustain us all.